DR. 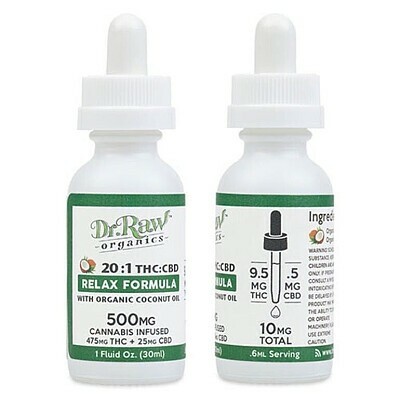 RAW ORGANICS- Relax Formula 1:20 30ml Tinctures, Order Weed Online From East Of Eden Cannabis Co.
475mg THC | 25mg CBD | Organic Coconut Oil| Dr. Raw’s relax formula tincture is formulated with a 20:1 THC:CBD ratio. This formula produces a relaxing, euphoric effect. Made with highly distilled, pesticide-free edible THC oil leaving a nearly clear, tasteless tincture. Our most versatile organic cannabis product. For sublingual application, topical application or you can cook with it. Popular Tinctures from East of Eden Cannabis Co.